This subdivision snake could swallow a large dog and no doubt has! Weighing as much as a Bullmastiff, the monster rattler lives on a smorgasbord of delectable pets. 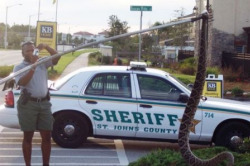 St. Johns County sheriff shown holding 15 foot long subdivision snake weighing well over 150 pounds! Floridians know dogs are a favorite delicacy for alligators and they take precautions. What they don't realize is that toy breeds are easy prey for venomous snakes that soak up sun along pathways through palmetto scrub and tall grasses. The "Florida Rattler" is not an aggressive snake. In fact, it uses those rattlers to warn away anything perceived as dangerous but when hunting a meal, the rattlesnake lays quietly coiled or slithers silently following the scent of potential prey. This reporter was "born and raised a Cracker" and native Floridians would not challenge the snake's size. Florida is famous for growing unusual creatures, some of which seem to have not only adapted but benefitted from the population explosion of the last three decades. Where once there was only swamp or palmetto hillocks, new homes surround shopping "centers" and wildlife has learned to adapt. Raccoons and other four-legged scavengers join the buzzards and crows along Florida roads, thriving on tossed garbage. Those are the visible critters gleaning a living from human encroachment and certainly a 'gator in the yard makes news. But snakes are furtive and this well fed rattler has thrived on more than mice and rabbits! No matter where you live, watch your children and FENCE YOUR DOGS. Wood, wire, or chain link, the spacing should be such that large snakes can't get in. A normal sized snake can swallow a rabbit. That is about the size of your toy breed dog. Of course the snake can't get back out through the fence after eating but it will nap under the house or in some sheltered part of the yard until the meal digests. Not to worry you - just to make you aware. A resident 'gator has no fear and is therefore visible but a snake is rarely seen. By the way, the King snake is protected and comes by his name rightly. The King snake kills rattlers. My mother narrowly escaped being bitten when she inadvertently disturbed a nest of tiny but extremely deadly Coral snakes in her garden. From then on, my father kept a King snake under the house. King snakes can be purchased online. Anyone with small children or pets should seriously consider purchasing a king snake to protect the premises from dangerous snakes. and anyone living in the suburbs. One more word of caution. Snakes like warm sandy soil such as is found under swing sets and other outdoor fixtures, including your Bar-B-Q. Watch where you reach if you have a built-in outdoor grill. 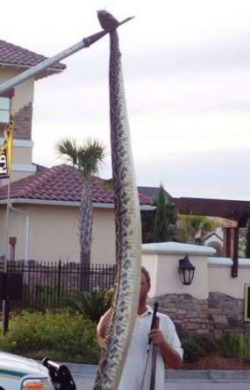 This 15 foot Eastern Diamondback rattlesnake, is the largest ever caught on record. This snake was found near the St. Augustine Mall outlet, in a new KB homes subdivision just south of Jacksonville FL. 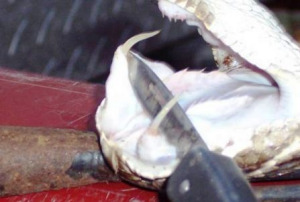 One bite from a snake of this size would contain enough venom to kill over 40 full grown men. The head of this snake alone is larger than the hand of a normal sized man. A bite from those fangs would be comparable to being stabbed by two curved, 1/4 inch diameter screwdrivers. The knife being used to draw out the fangs for the bottom picture has a blade around 6 inches long. This snake is estimated to have weighed over 170 pounds. Notice the girth of this snake as compared to the cop's leg in the first picture. (and he is not a small man). A snake of this size could easily swallow a child (and dogs, pigs, etc). Again a word of warning. Exterminators are expensive and snakes are furtive and hard to find. Rattlesnakes may live under your house, a tool shed, or as mentioned, in landscaping shrubbery. While they do eat mice and other bothersome pests, a big rattler will strike when disturbed or hunt, strike, and swallow a small pet. Your best defense against vermin and poisonous snakes is a king snake. They are not poisonous but kill by constricting and the king snake hunts other snakes! Many people keep king snakes as interesting pets but they are best kept as rodent and snake killers!